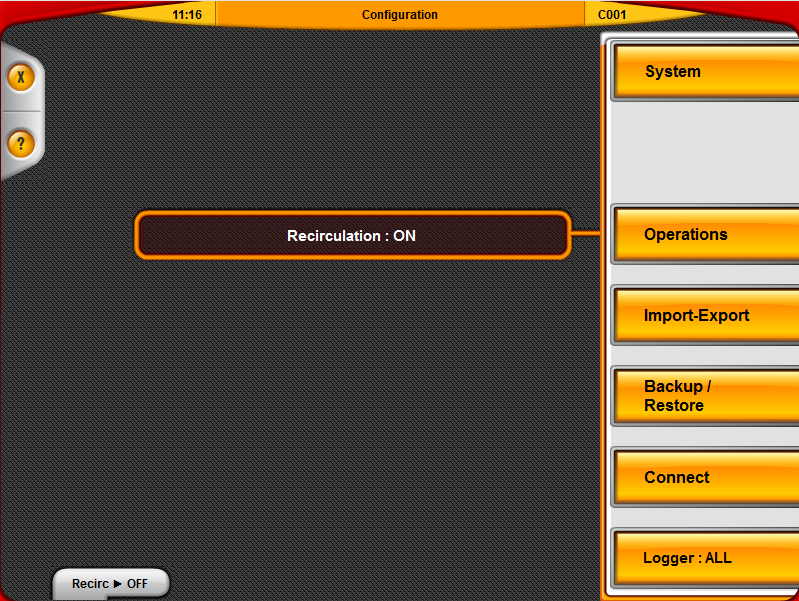 From CPC version 1.6 onwards the button to turn the main recirculation program on ColorPoint on or off has been moved from the recirculation settings page to the main configuration page along with an info panel on the configuration page showing the current recirculation state as shown above. When the button was on the page for a particular pump's setting it was easy to confuse the use of the button as being only for that pump. The new button indicates the recirculation state that pressing the button will achieve, e.g. 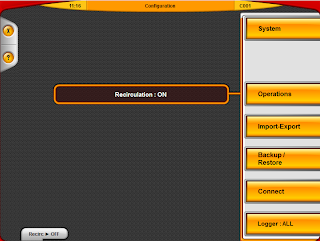 "Recirc ► ON" will turn on recirculation when it is already off and "Recirc ► OFF" will turn it off when it is currently on. In ColorPoint Manager many views are lists of entities such as materials, formulas or returns. These list views can be customised to show only the information you require, in your preferred order. To show or hide list view columns simply right-click on any column header in the list. This presents you with a list of available columns. Those with check marks will be visible, those without will be hidden. Repeat this process until the columns you wish to display are all selected. 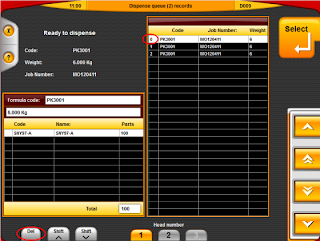 To change the order of columns, simply click on the column header and drag the column to a new position. A small dot will appear between the headers showing where the new position will be when you release the mouse. These settings are stored on a per user basis, so changing this on one login will not change how any other users views the data. The dispense queue holds dispense requests for the user. These requests can be dispensed in the order they were added to the queue, or the operator may choose to dispense the requests in any order. When a dispense completes and the operator presses the "Next" button one of two things will happen. If there are any further dispense requests in the queue, the next item in the queue will be presented to be dispensed. 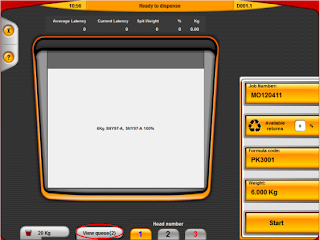 If there are no further items in the queue, the operator will be shown either the job list or formulation list, depending on the source of the last dispense. Sometimes items may be added to the queue that are no longer needed. In this case there are two ways to remove them. On the dispense page the queue button shows how many items are currently in the queue and provides access to the queue page. Press the View Queue button. In the dispense queue page navigate to the items you wish to delete and then press the delete button. If you want to empty the queue completely, keep pressing the delete button until you are returned to the job or formulation list. 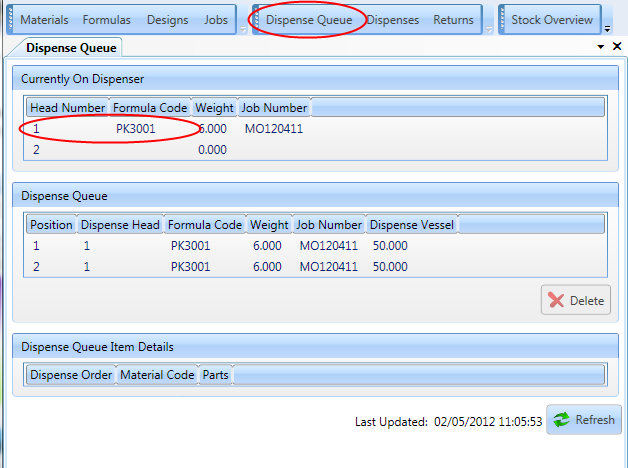 This ensures that all items, even the item at position 0 (currently selected on the dispense page) are removed. In ColorPoint Manager open the Dispense Queue using the button on the tool bar. The delete button can be used to remove individual items from the queue. 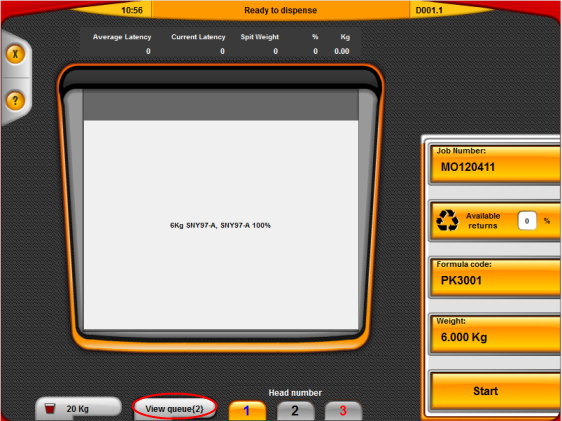 Note that the item currently selected to dispense is shown as on the head and cannot be deleted remotely. To delete this item always use the delete button on the console.